With two toddlers running wild around this joint, my time for cooking meals seems to be dwindling away. People tend to assume that I have these perfect, from-scratch meals on the table every night, and to be honest, at this stage in our lives we’re still very much in survival mode. I’m pretty gentle with myself and focus on the big picture as much as possible. If everyone is happy with a full belly, well that’s success! We all do the best we can. Raising a family is messy and imperfect and humbling. Is it kid-friendly? Well, it is and it isn’t. 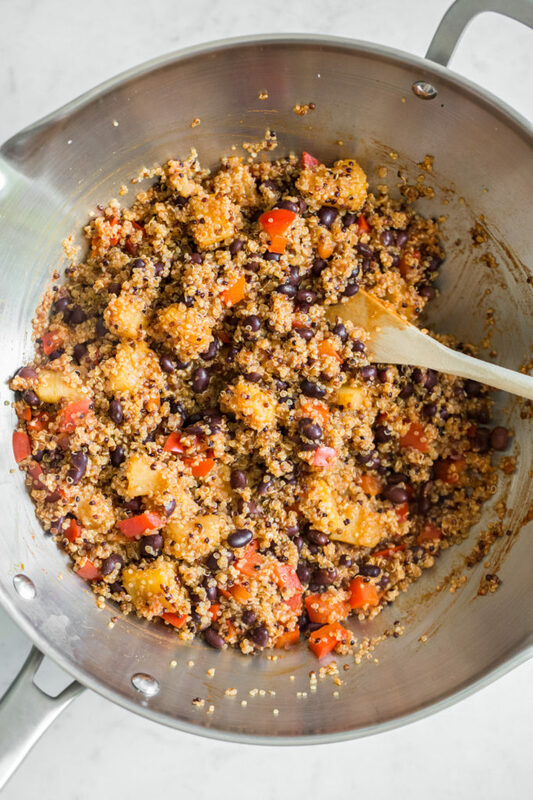 If your little one loves quinoa, they may enjoy this dish (reduce spice if necessary). If they don’t already like quinoa, it’ll likely be a pass (shocker). I had one love it and the other said “EWWWWWW!” (their new favourite word…sigh). The one who inhaled it the first night wouldn’t touch it the next day. *double sigh* The feeding toddlers struggle is real. For us normal folk, it seemed to be a hit! My mama testers lit up with joy when they heard it was a one pot meal. And, I mean, you don’t even have to sauté anything! I’m anxious to hear what you think if you try it out. I always worry that these super easy recipes are lacking in some way, and I hesitate posting them. Well, my fellow Canadians, I hope you have a fun Canada Day weekend! Hard to believe it’s already upon us! And for my American friends, have a fantastic Independence Day next week. Are you celebrating with any OSG recipes this weekend? Let me know and be sure to share on social media using the tags #ohsheglows and @ohsheglows so I can drool over them! 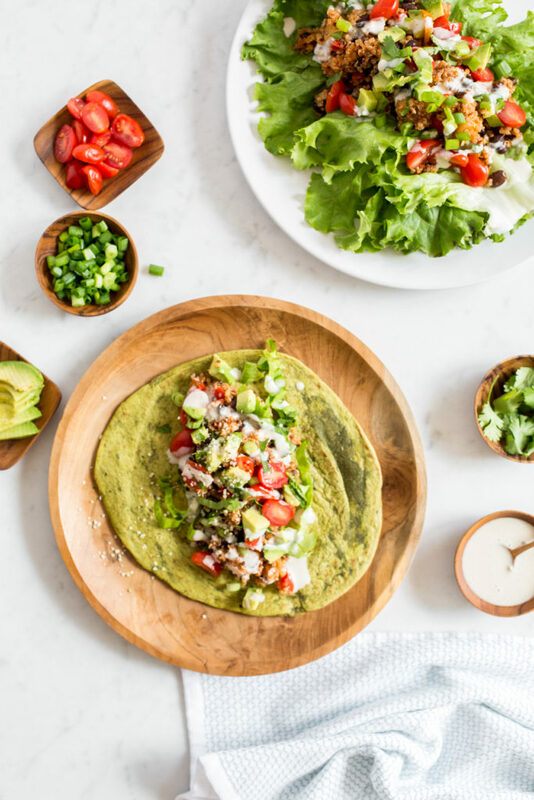 These quinoa wraps are ready and on the table in less than 30 minutes and will only set you back 10 minutes of prep! This is a great go-to summer dish when you don’t want to turn the oven on, but still want a well-rounded, fun meal. 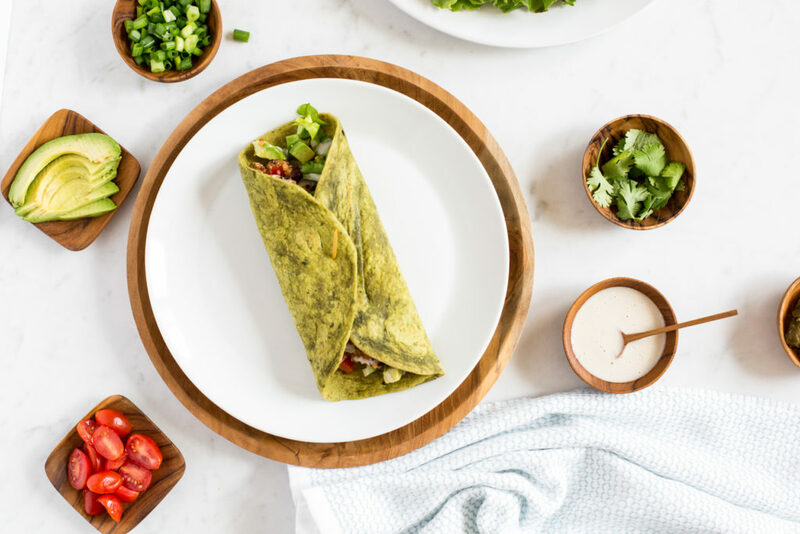 Enticing flavours like sweet pineapple, smoky paprika, savoury coconut aminos, and spicy cayenne pepper come together to create a delectable base for these healthy wraps. 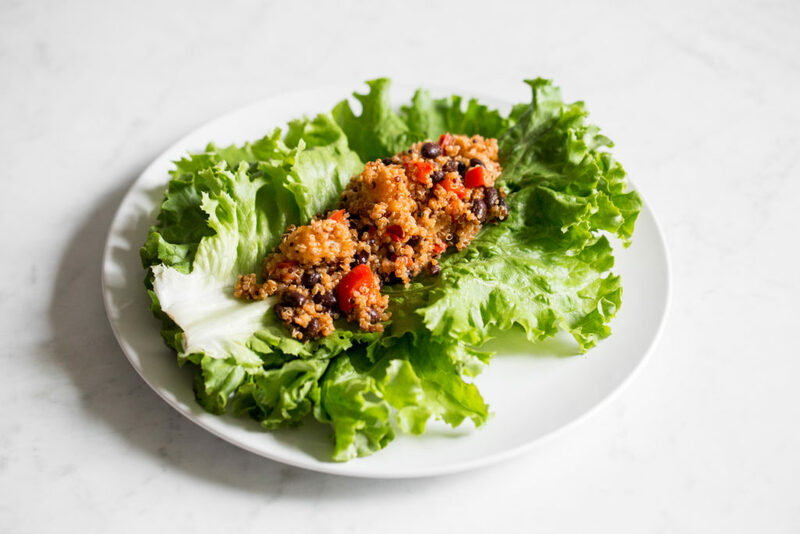 The crunch from the lettuce wrap is a nice contrast to the soft and chewy quinoa and beans, but feel free to use flour wraps and simply stuff some lettuce inside instead. Don’t forget about the toppings too—they really complete the dish and enhance the flavours and textures! 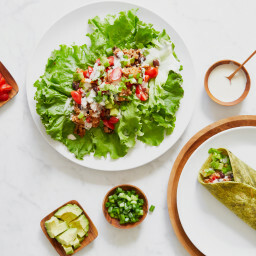 I love my wraps topped with avocado (duh), runny tahini or cashew cream, cilantro, salsa, and sometimes pickled jalapeños for a kick. Gather your quinoa ingredients on the counter so you have them ready. To a large pot, add the quinoa and broth. 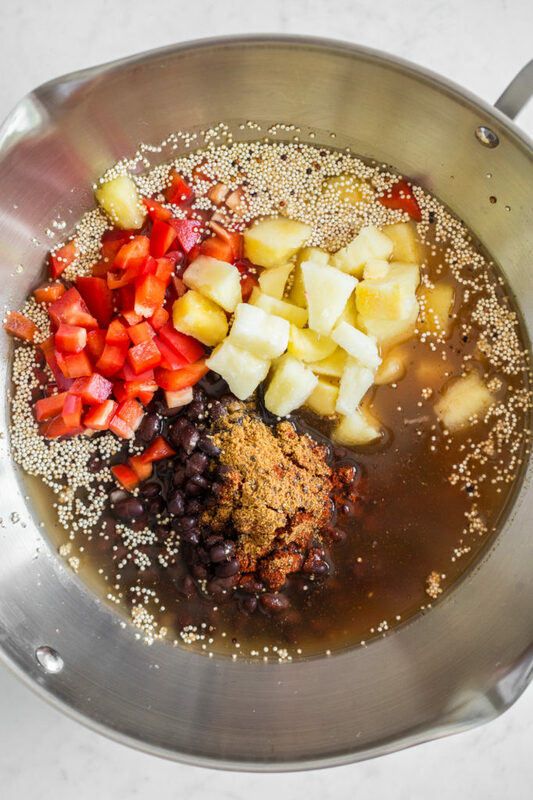 Set the heat to medium and bring to a simmer while you add the rest of the ingredients: drained black beans, red pepper, pineapple, coconut aminos, paprika, cayenne, lime juice, salt and pepper. Stir to combine. Bring to a low boil over medium-high heat. 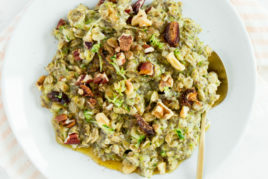 Reduce heat to medium, cover, and cook for 16 to 21 minutes, reducing heat if necessary, until the quinoa is fluffy and the water is mostly absorbed. I recommend checking it after 16 minutes and then every few minutes thereafter. Stir the cooked quinoa mixture and season to taste. 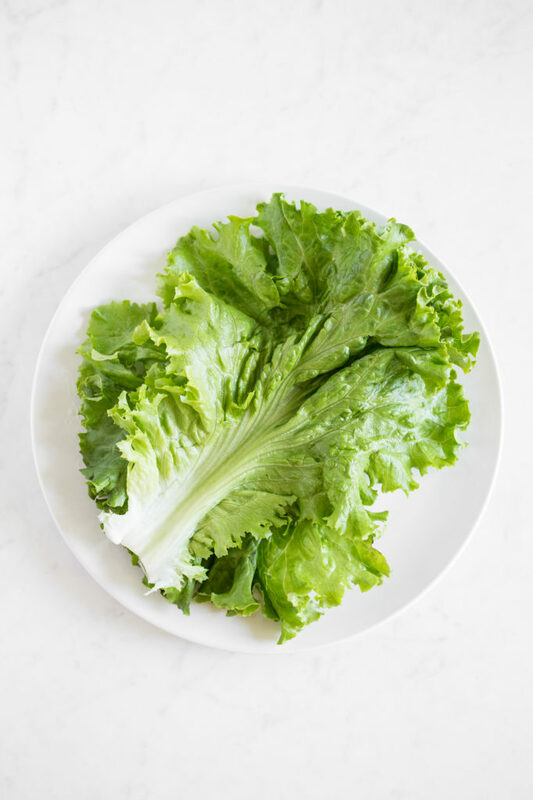 If using lettuce for your wraps, place one large leaf on a plate. Add another leaf on top so that its base is pointing the opposite way of the leaf below. 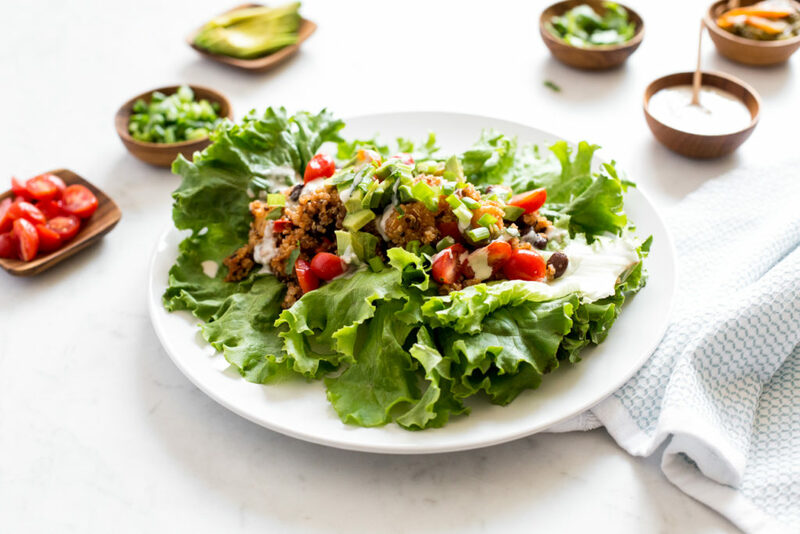 Top each lettuce wrap (or flour wrap, if using) with a spoonful of hot quinoa. Add your desired toppings (I like to use every topping listed), a small pinch of salt, and a lime wedge on the side. If the lettuce wraps are too difficult to eat with your hands, you can dig in with a fork and knife. 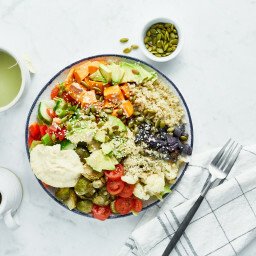 The quinoa is best served fresh as it tends to dry out in the fridge, but you can store it in an airtight container in the fridge for 1 to 2 days. To reheat the quinoa, add it to a pot along with a splash or two of broth, cover, and warm on the stovetop over medium heat. You’ll likely need to add more seasonings as the flavour diminishes over time. Nutritional info does not include wraps or toppings. * You’ll want to dice the red pepper very small (think almond-sized) so it cooks quickly. ** My frozen pineapple chunks are quite large, so I like to chop them into almond-sized pieces before adding to the pot. This way the pineapple gets spread around a bit more! *** You can use salt in place of the coconut aminos if you’d like. I found I needed 1 1/4 teaspoons pink salt or a bit more to make the flavours pop. Start with half and then add the rest after cooking to taste. **** For a kid-friendly option, reduce or omit the cayenne pepper as needed. Whenever I make a dish like this or even just beans and a grain, I serve it to my two boys (4 and 1.5) over unsweetened applesauce. They gobble up every bite! haha…genius. I would’ve never thought to try that!! Thanks Amy. My kids sure love applesauce. My fiancé is not a big quinoa fan (it is not just picky toddlers! ), thoughts on using millet? I’ve recently gotten him on board with millet luckily :), he also is a fan of barley. Just want to keep one pot /easy since we both work late! Ah yes, I know quinoa isn’t sold on everyone! Luckily the other flavours mask the quinoa flavour pretty well. :) I haven’t ventured into trying other grains yet, but if you do please let me know how it goes! I’d love to hear. Hi Anglea! 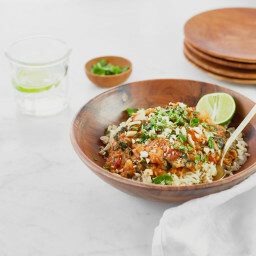 Do you think this would work with farro instead of quinoa? So just so everyone knows farro is wheat and definitely not gluten free. It should work fine though. Rice or cous cous (not gluten free) might be another option. Looks great! I love that I can get everything prepped for this ahead of time and cook it when I get home from work. Win win all around. Thank you, thank you for a one pot meal! Can’t wait to try this. Do you think canned pineapple would work or will it get too mushy while cooking? Maybe drop it in towards the end? I think your idea of adding it near the end may be a good thing to try out…let us know how it goes! 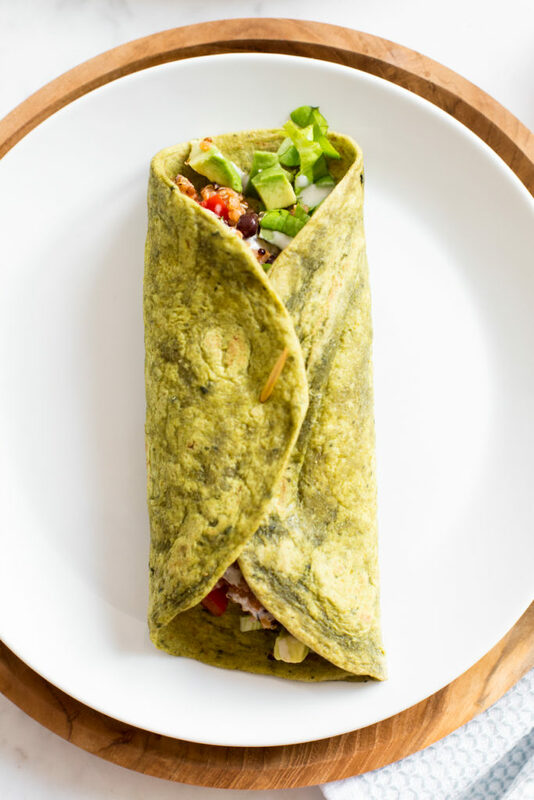 What is the wrap made of….store bought or homemade? Looks delicious! Hi Ann, The green wrap is by “Silver Hills” and it’s there organic spinach whole-wheat wrap. Nice and soft and I like knowing they sneak in a bit of green. My daughter is also not a quinoa fan, but she loves black beans, red pepper, and pineapple, so hopefully her love for those will overtake her dislike of quinoa. This looks wonderful and I will be trying it this weekend. We also have some maple leaf flags to fly on July 1 – we love you guys! Aww thanks Connie!! That’s so sweet. I hope your daughter loves it. I find the toppings really help (and of course the wrap) in disguising it a bit. OMG — this looks so good! Recipe is printed and ready to go for my meal prep next week. Excited to try it! Thanks for sharing! Can this be made in the instant pot? Looking forward to trying this recipe!! 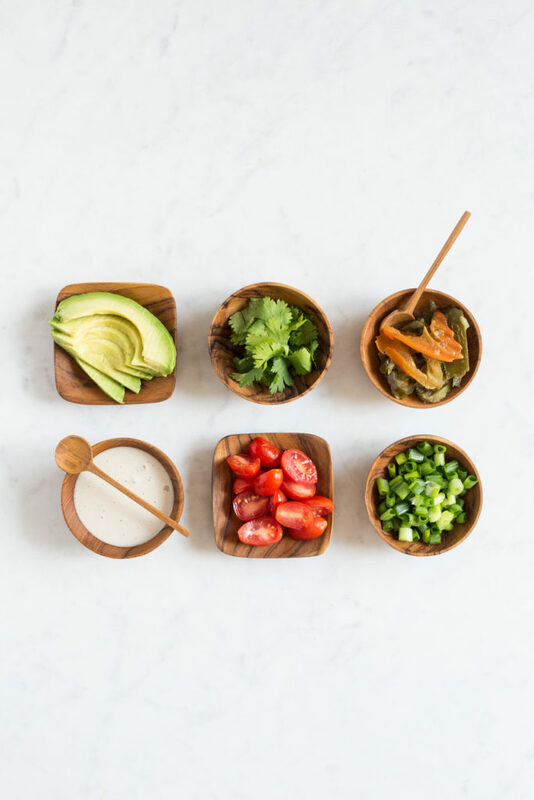 Hey Annie, Another reader just shared her Instant Pot tip, so I would check out the comments :) She said it worked great! Love how many ways you can eat this! 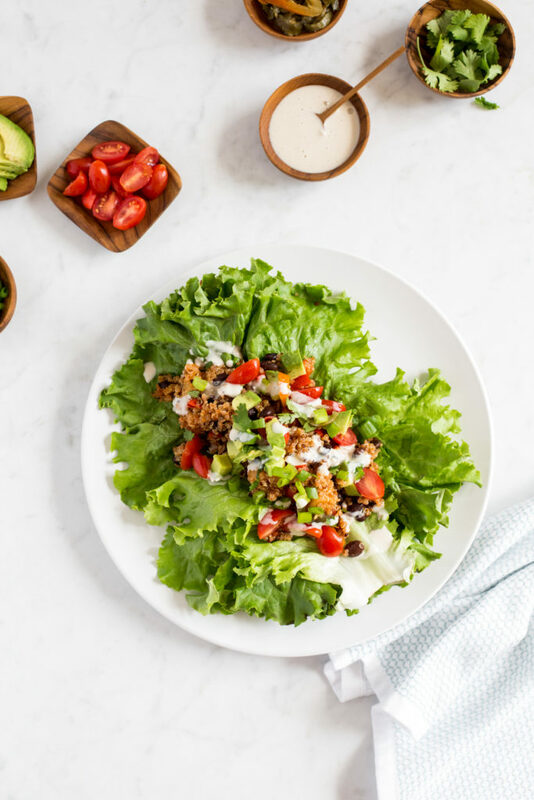 Lettuce wraps, by the spoonful, tortillas, quesadillas, with tortilla chips…so many possibilities! :) Maybe stuffed in a pepper too?! Oh, I love the super-easy recipes…that’s where it’s at for me right now! Looking forward to trying this out (the kiddo is a HUGE fan of beans). I do love more complex recipes too, but they get filed away into the “someday…” folder. Really admire your ability to keep this blog going with two little people in the mix. Thanks Eleanor :) I hope your little one loves it! That looks awesome and pretty sure it will taste that too. I’m always on the lookout for delicious and simple dishes like this. I might try this with cauliflower rice instead of the quinoa (and minus the cooking of course..) which I think might work well too! Thank you for sharing! I actually AM making some OSG recipes for next week. Your ‘what recipes work for a roadtrip’ post is now essentially our roadtrip menu! Excited for gazpacho and chickpea tuna salad. Probably also some sort of energy ball or bars. Thanks, Angela! I’m so happy to hear you found that post so helpful for your road trip menu! :) (If anyone is interested the blog post is here: http://ohsheglows.com/2018/05/15/vegan-recipes-and-snack-ideas-for-camp-and-travel/) Have a great trip Allison! I just made this in the instant pot…the perfect Instant Pot recipe! I just threw everything in exactly as the recipe says, and put it on Manual for 2 min Natural release. I put the instant pot on the front porch outside to avoid heating up my house on this hot day!! Our 5 year old gobbled it up. The 3 year old was less enthusiastic but managed! Hey Meghan, That’s great it worked in the Instant Pot! Thanks so much for sharing how you made it. I’m so glad at least 1/2 kids enjoyed it…I find that’s always the way with two. Thanks Hannah, I hope you both enjoy it! Thank you for sharing yet another fantastic invention of yours! I love the addition of pineapple into the recipe! Looks delicious! What a fabulous recipe! I’d totally eat the filling in a Buddha bowl or on top of a salad too! 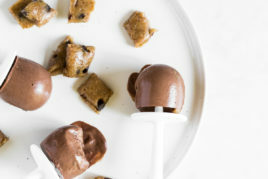 This recipe is not only amazingly delightful, but easy as well! Make it as is. I have already done so twice in the last week, as it is that good. A toasted Ezekiel tortilla is great for some crunch alongside. Thank you, Angela! Hey Kelly, Thanks for your review…so glad you love this recipe! This was delicious! We didn’t change a thing. The paprika and pineapple are perfect in this. So easy to make and tastes even better the next day. Hey Stacey, Thanks so much for trying it out and letting us know how it went. So glad it was a hit! I made this this past week and it was strange… but I think it was because of the substitutions I made so I’m going to try it again. – what brand of smoked paprika did you use? I have “La Chinata” brand and find it so strong, I only used 1/2tsp in your recipe. – I used Tamari in place of coconut aminos which tasted odd… I should have used your suggestion and just added more salt!! Hey Lindsay, Oh sorry to hear that! I suspected that Tamari might be too strong for this recipe. My smoked paprika brand is McCormick :) I hope it goes better if you try it again with coconut aminos or salt! Hi there – love your blog! I have an almost 8 month old who is LOVING all the new solids he’s been trying via baby-led weaning (infant self feeding). It’s so fun to watch him eat! Did you start your babes plant-based from the very beginning? Can you share some insight on how to do so healthfully? I feel totally confident avoiding meat and dairy but am wondering about eggs for him. Thank you! Hey Betsy, They eat mostly plant-based at home, but they do eat local & organic eggs and occasional meat. Loved it! I used mango and chili powder instead of pineapple and paprika because that is what I had on hand. Thanks for the super fast and easy meal idea! Oh such a good swap! Thanks for sharing…can’t wait to try it. OMG — this looks so good! I loved this recipe! So delicious and so easy to make. I was able to pull it together in just the (short) amount of time my ten month old allows me to prep dinner! I’m so happy to hear that Ashley! :) Thanks for letting me know. Aww that’s hard. I hope things look up for you soon! And I’m glad this recipe came at the right time. Why frozen pineapple? Couldn’t you use fresh or canned? Coconut amino? I’ve used Braggs Amino but have never seen coconut. Hey Patrice, Yes you can use fresh and if you use canned i recommend adding it near the end of cooking so it doesn’t get mushy. I’m so happy to hear how many of you have been enjoying this easy dish! Thanks for letting me know, Sarah! I’ve been following this blog for years now. I made these this past weekend for lunch this week and they were absolutely perfect. Huge fan! 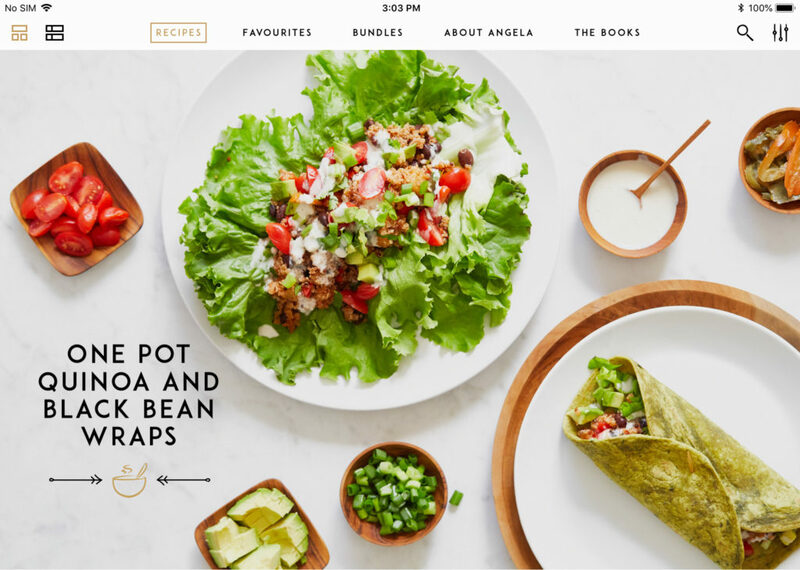 Thank you so much Angela for these fast and delicious recipes- they help so much with meal planning and make me feel like I can still take care of myself without a whole lot of time! Hey Caroline, thank you so much for your support! That really means the world to me. I’m so glad you enjoyed the wraps, too! I’ve had them on repeat over here. There’s a one pot kale and quinoa recipe on that website food52 that i make alllll the time (although i use capers or olives instead of the feta) and i am such a fan of the one pot quinoa! Actually have made it with quick cooking barley and that was delicious too. Love that your recipe here includes beans! I don’t like fruit in savory dishes so i’ll leave off the pineapple. I bet there are a lot of variations that could be adapted to this method! Hi Angela. This looks delicious and I can’t wait to try it. Do you think it would freeze well to be eaten later? 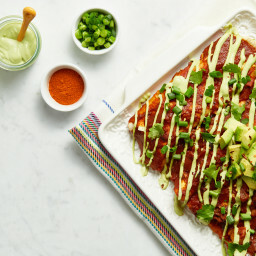 I freeze your next level enchilada mix and it’s great eaten later. Thank you! Hey Tracy, Quinoa is a tricky one because it soaks up the flavours. My guess is that if you freeze it the mix will be a bit bland after thawing and reheating. I think if you amped up the flavours to taste while heating it might be fine though! So glad to hear you enjoy the enchiladas! This recipe looks so good! I love black beans, they are a great source of fiber! This looks super delicious! Superfood comfort food. I love that it’s packed with so many healthy ingredients. 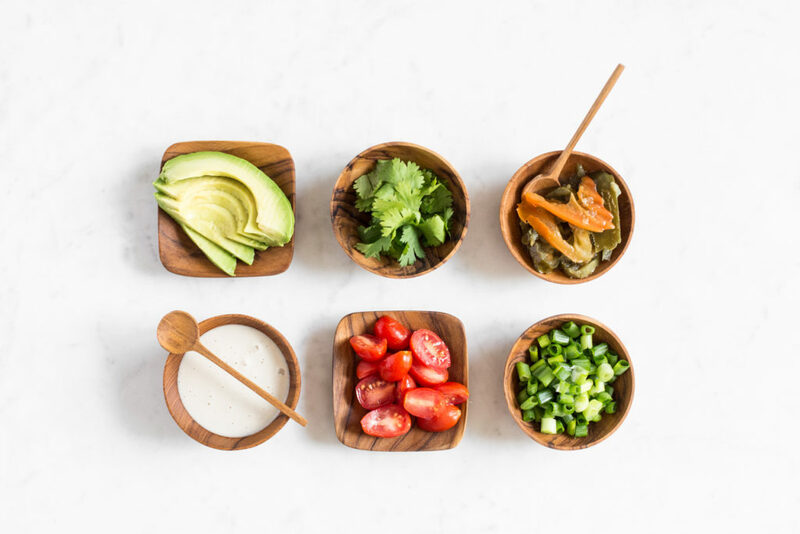 I’ve been wanting to add more whole-food grains to my regular diet, and this is a great way to do it (combined with plenty of vegetables). I plan to use quinoa, but I think brown rice would work well too. Thank you for the recipe. Made this tonight and it was sooooo good! I even had to sub water for the broth and mix up the spices a bit bc I’m out of smoked paprika- still a winner! As a busy mama of 7, I would LOVE to see more ‘one pot wonders’ like this! Especially with school starting soon…. they would be super helpful to have in my rotation! Thank you! These look like great wraps. I’m definitely more of a flour wrap guy. I also like to make mine with chickpea batter. I always keep a supply of black beans on hand just for things like this. Hey Richard, thank you! I’d love to hear how it goes if you try them out. Made this twice in a week! So yummy! I like eating it as a burrito bowl type of dish! Hey Jill, I’m so glad you’re enjoying the recipe! I love your idea of serving it burrito bowl style too. i added a diced jalepeno and edamame for an extra kick – so good and so easy! Love that idea…thanks for sharing! can the pineapple not be frozen and canned?? You had me at ‘one pot’! :) Very yummy! I used Swiss chard as my wraps! love that idea :) Thanks for your feedback!! Can I make this in an instant pot? Hey Christina, Oh good question…I haven’t tried it before so I’m really not sure. If you do I’d love to hear how it goes! This recipe is super easy, delicious and is now part of our regular rotation. Thank you Angela! I no longer eat anything spicy and therefore left out the cayenne. It is still very flavorful. By the way, we used canned pineapple and it was fine being added at the beginning. It was not mushy, but keeps the soft consistency that it has coming right out of the can. What can I sub for pineapple ? No one in my house likes them .